2K Games has announced Minerva's Den, an upcoming DLC expansion for BioShock 2 that will finally bring some meaningful new single-player content to the game. The BioShock 2 DLC situation hasn't exactly been a non-stop cavalcade of awesomeness so far. Most of it has focused on multiplayer and the one single-player expansion that's come out, Protector's Trials, was little more than recycled levels and pointless exercises in defending a Little Sister from onrushing Splicers. But now it looks like 2K is finally ready to come across with something worthwhile. In Mivera's Den, players will explore Rapture Central Computing, a never-before-seen area of the city packed with deadly Splicers, upgraded security bots and even a brand new model of Big Daddy. Players will have access to high tech weaponry and a powerful new Plasmid as they join up with Dr. Tenenbaum to free the district from the clutches of a tyrant and uncover yet more dark secrets about Andrew Ryan, the increasingly villainous founder of Rapture. "Minerva's Den is a substantial addition that will give players more of what they're looking for: more story, more narrative, more gameplay and more of Rapture," said 2K Games President Christoph Hartmann. "The core team has created an exciting product that further enhances the mystery and allure of the world of Rapture. Minerva's Den will be a fitting conclusion to the BioShock 2 saga." That "fitting conclusion" remark sounds a bit odd in light of the fact that last month, Hartmann described the Protector's Trials release as "just the beginning" for single-player DLC. Is it really the end for BioShock 2? We've dropped a line to 2K Games and we'll let you know what they say. 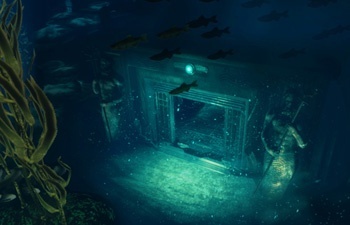 Minerva's Den was created by BioShock 2 studio 2K Marin for the PC, Xbox 360 and PlayStation 3. Prices and release date have not yet been revealed.